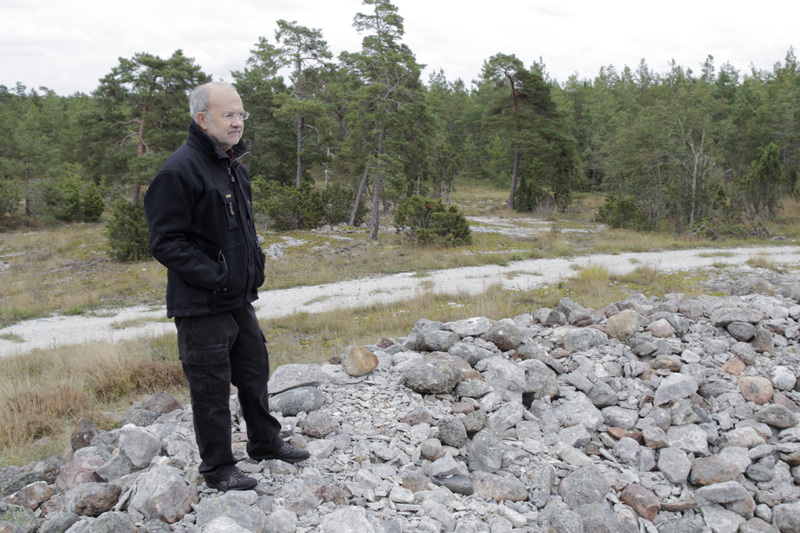 I visited Gotland for the first time last year, when I ended my Scandinavian tour with an artist talk hosted by the Brucebo Foundation, the residency that sponsored my travel research. It was kind of them to welcome me again this year for another week of shooting throughout the island. My particular focus on Gotland may be strange considering my intention to follow the westward Viking routes. Sweden and more particularly, Gotland, are countries that face east and therefore have stronger links with Russia and even the Arabic world. 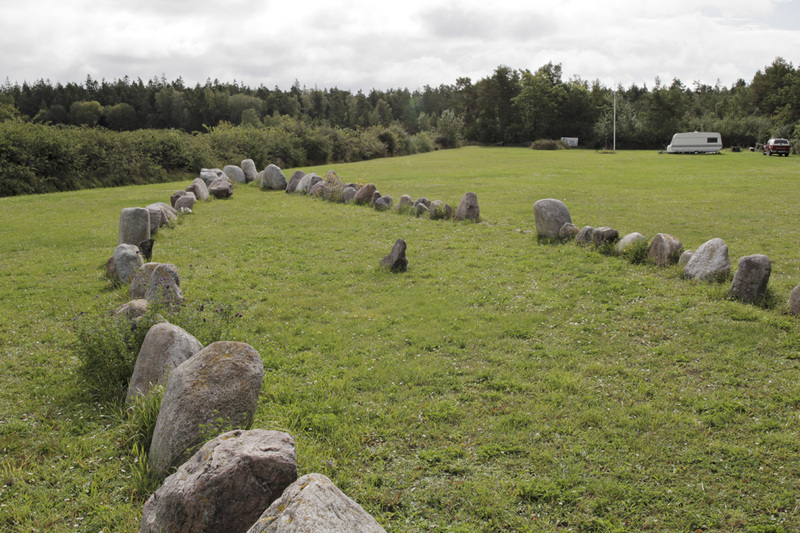 But my story must begin somewhere, and Gotland has the highest concentration of pre-historic and Viking-age ruins throughout Scandinavia. Not to mention the world-renowned Gotlandic light, which has attracted artists to the island for centuries. 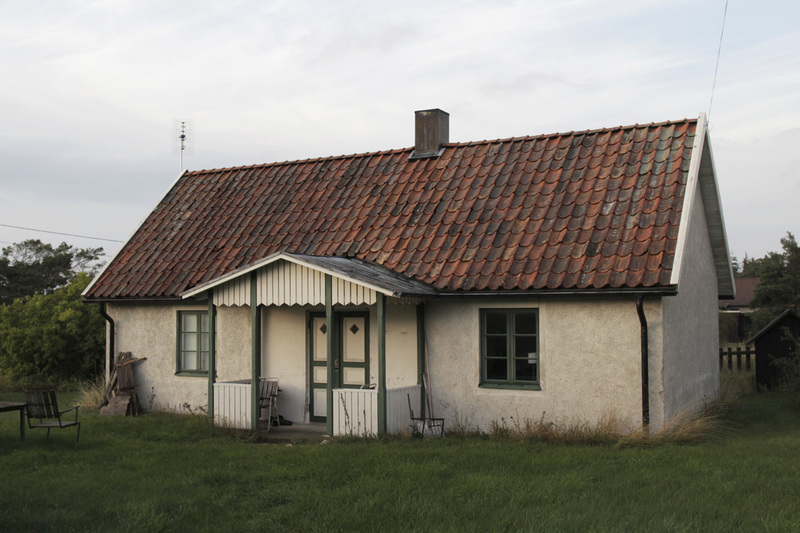 The Canadian cottage on the Brucebo estate in Gotland, Sweden (bathing in late-evening Gotlandic light). Photo by Jessica Auer. 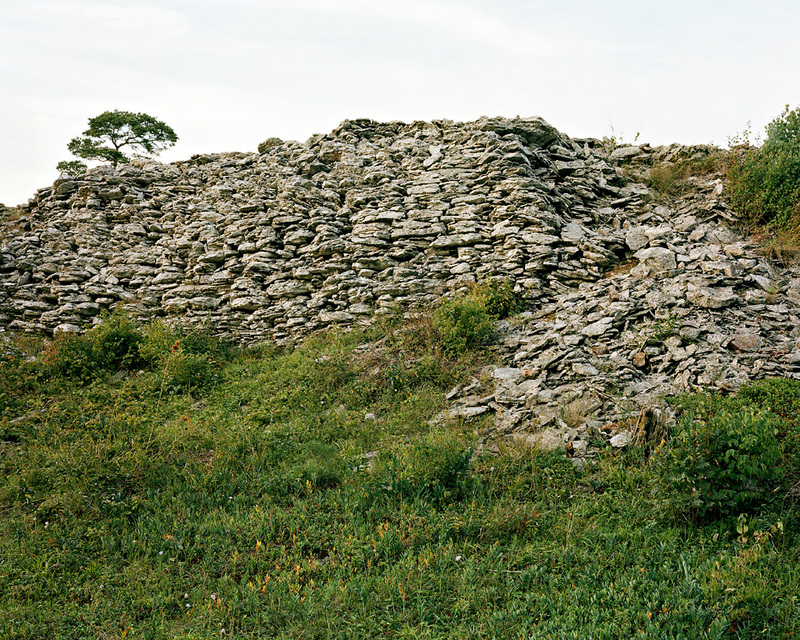 Another aspect of Gotland that I find very attractive is its cultural identity and history of independence. 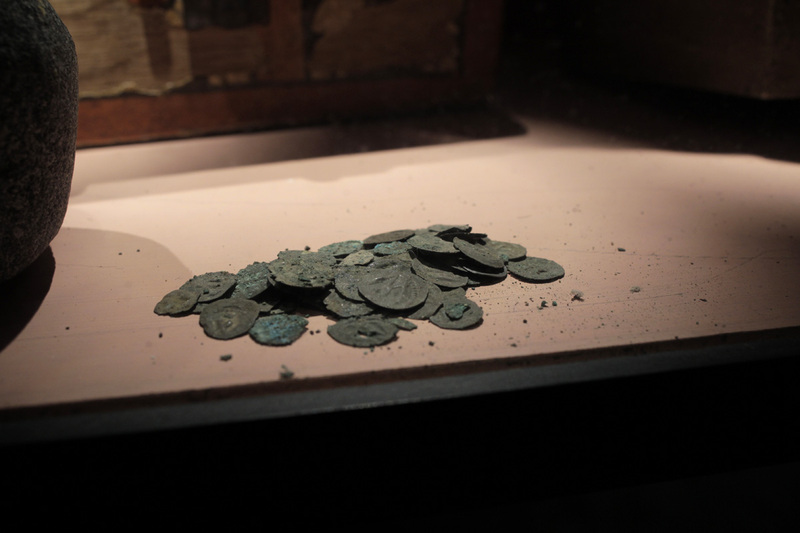 Although Gotland is part of Sweden, the island was not subject to Sweden throughout the Viking age and earlier. Like Iceland, Gotland was not ruled by kings, but by the people themselves, whereby law and order was managed through Thing assemblies. This philosophy is still strong today. During a dinner meeting in Visby with a Norwegian writer, I asked him what it was like to be a Norwegian living in Sweden. He responded that Gotland is not really Sweden and that when Gotlanders travel to the mainland, they claim that they are going to Sweden. Själsö fishing village on the west coast of Gotland. 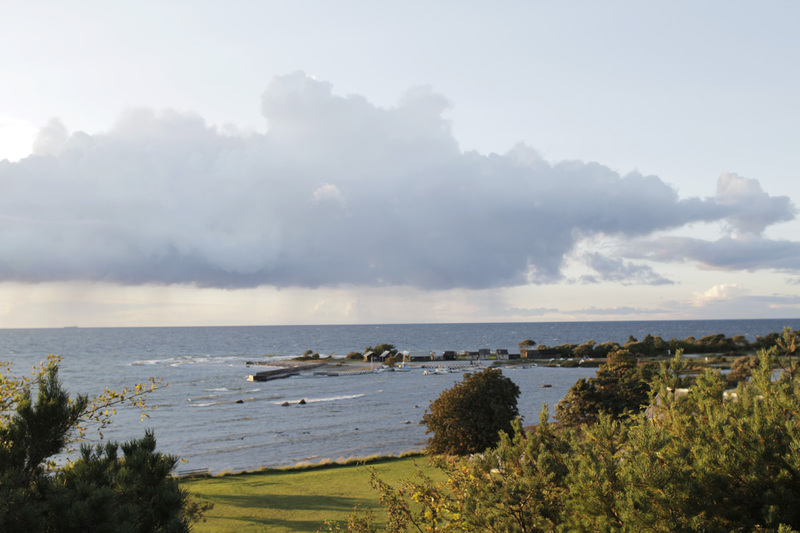 Gotland is located in the Baltic sea, just east of the rest of Sweden. Photo by Jessica Auer. All the friends and contacts that I have made in Gotland are not native to the island. My archeologist friend Dan Carlsson has been living in Gotland for 30 years and has an extensive and intimate knowledge of the geography and history of the place yet acknowledges he is not a true Gotlander. This reminds me of Lucy Lippard’s book “The Lure of the Local”, where her focus on maritime New England proposes that some cultures are extremely protective of their identity. As an outsider ‘fitting in’ may seem impossible, yet I enjoy the exceptional parallel between the preservation of historical sites and of the island’s cultural identity. 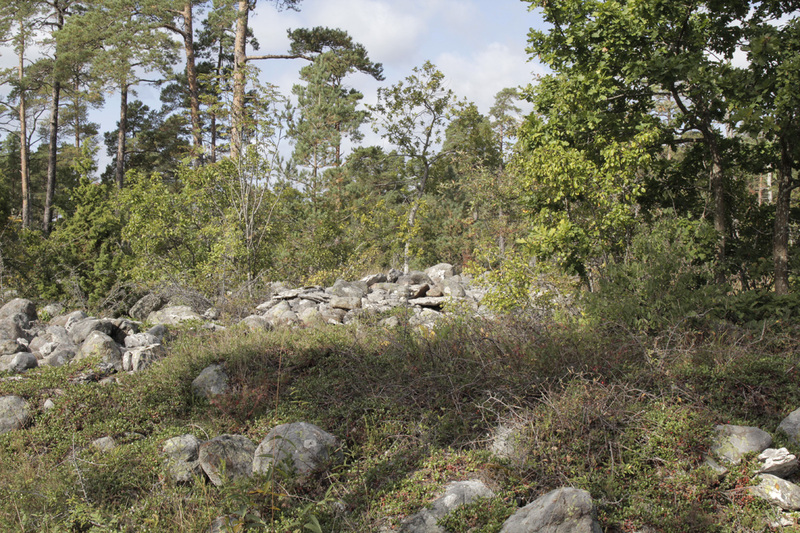 A burial cairn found in the forest near Fjäle in Gotland. Photo by Jessica Auer. Despite the simple writing style of the sagas, I am often astounded by the complexity of the characters portrayed. Saga authors tended to craft their tales on the stories of anti-heroes, protagonists who commit despicable deeds yet were admired for such qualities such as their strength, cleverness and courage. Surprisingly, one the most admirable traits a Viking could have is the ability to compose poetry. 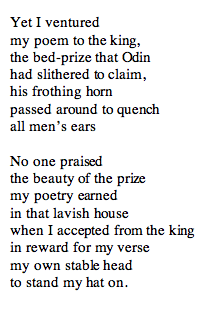 The reference to Odin’s “bed-prize” is explained in the Prose Edda, Snorri Sturlusson’s adaptation of the Poetic Edda, a collection of Old Norse poems. Poetry is so important to the Norse Gods that in this story, Odin embarks on a perilous mission to steal the “mead of poetry” from a greedy giant. Apparently both Egil Skallagrimsson (910-990) and historian Snorri Sturlusson (1179-1241) had their share of poetic mead for Egil is a gifted skald and Snorri a notorious scholar. Coincidentally, Egil’s Saga is the only saga for which we may know its author: Snorri Sturlusson himself. Egil’s Saga presents elaborate historical information on political rivalry in Scandinavia, which Snorri would have been able to compose, in addition to intricate descriptions of the region of Iceland where Egil’s Saga takes place. Snorri lived at Borg for some time, while he was married to an heir of the estate. 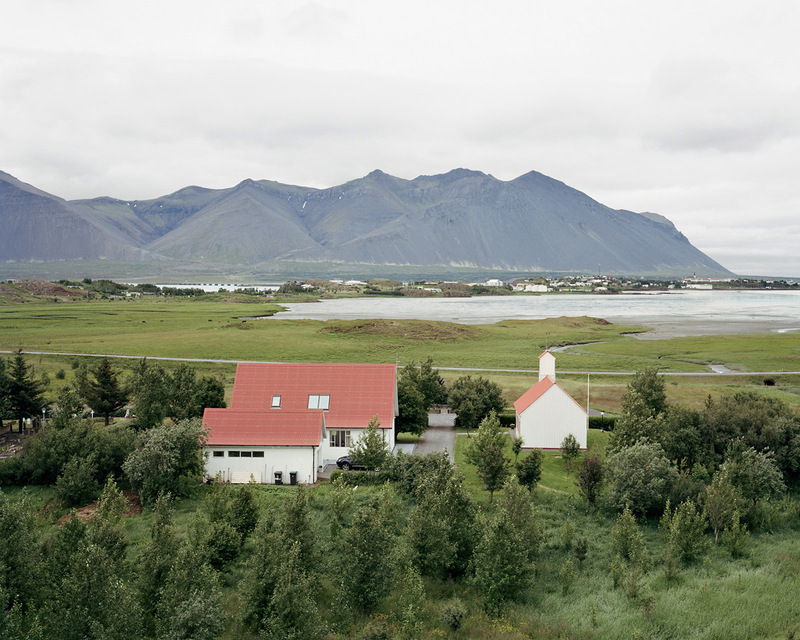 The farmstead at Borg in western Iceland. Scan from a 6×7 cm negative. Photo by Jessica Auer. On my visit to Borg, I was impressed to see that a farmhouse and church still stands at the exact site of the farm Egil’s father had established as one of the first settlers in Iceland. Furthermore, I also went to Reykholt, the town where Snorri composed the Edda and other works. 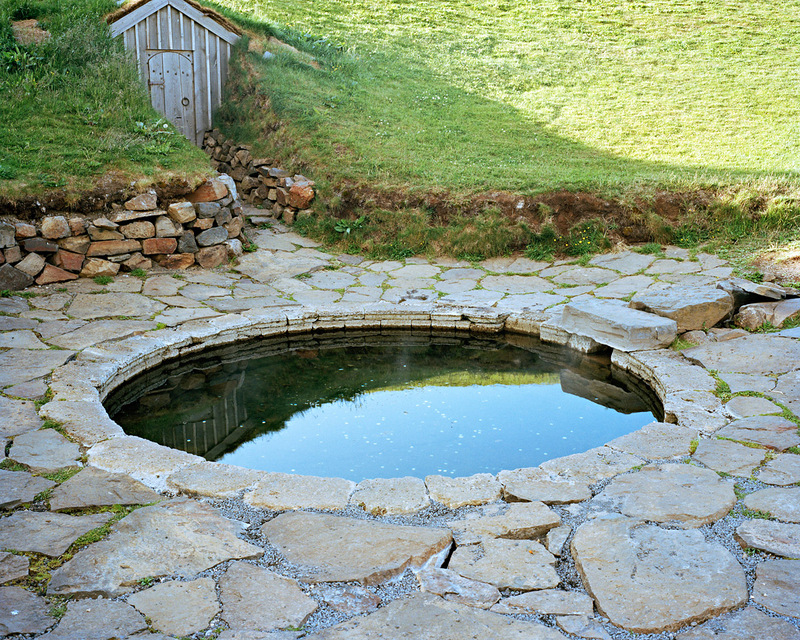 Snorri is still very present in Reykholt where he is commemorated with his own museum, Snorrastofa, and a small hot spring called Snorralaug “Snorri’s Pool”. It is believed that this is where Snorri came to bathe and undoubtedly reflect on history and politics. 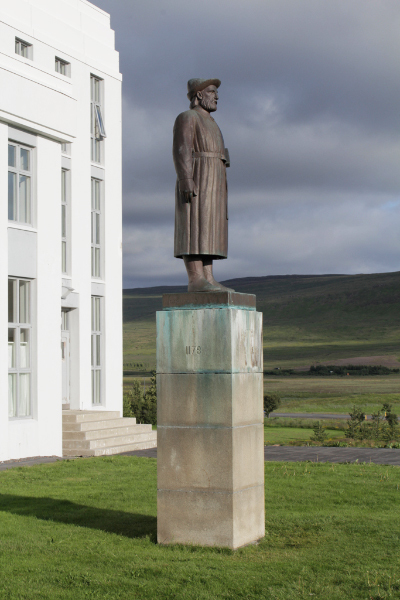 A statue of Snorri Sturlusson outside of the medieval study centre in Reykholt, Iceland. Photo by Andreas Rutkauskas. The stones at the base of Snorralaug could be original from the Sturlung era. The tunnel passageway, through the wooden door seen behind the pool, led to the farmhouse where Snorri Sturlusson lived. Scan from a 6×7 cm negative. Photo by Jessica Auer. As I lay flat on my back, bundled in my down sleeping bag, I passed the time by counting the number of seconds between flashes of lightning and the pounding of thunder. One-one-thousand, two-one-thousand, three-one-thousand… the ground beneath me shook. This was last week while I was on a backpacking trip in Canada’s rocky mountains. I was on retreat from computers, art, and inevitably Vikings, yet nature found a way of putting Norse mythology back in my mind. It was a gorgeous evening when we hiked into Og Lake. We were in the alpine zone, too high in altitude for tall trees and so the views were open in all directions. The surface of the lake shimmered like a jewel within the wilderness landscape. As I hiked down from the Valley of the Rocks with my husband, we had the intuition to make camp rather quickly; set up the tent, pump fresh water, cook up dinner. There was only one other couple there. Our new friends were optimistic that the dark but colourful clouds were moving away from our camp. 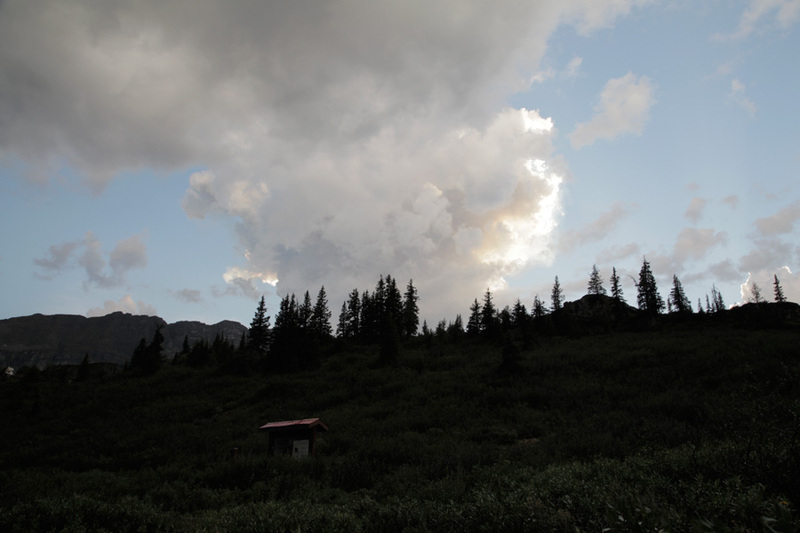 Thunderheads approach our camp at Og Lake near Mount Assiniboine. Photo by Andreas Rutkauskas. Minutes later, hale descended from the heavens. We took shelter in our tent. A lightning storm ensued and I was uncomfortably aware that our tent was the tallest structure around. Though the hale passed, the lightning did not. The wind had completely died and the storm clouds remained trapped above the lake. I lay there with my eyes wide open for almost three hours; the darkness was completely black in between bursts of lightning. I honestly believed that this could be it — the end. Overwhelmed by helplessness, I called upon the deity I felt was the most appropriate at the time: Thor, ruler of the sky and of thunder and lightning. And although the name Thor is derived from the word thunder, most stories and illustrations that feature Thor with lightning bolts are from popular culture, a further mythological-ized version of the god. The Prose Edda, complied by historian Snorri Sturlusson (1179-1241), is the most renowned work of Scandinavian literature. The Edda recounts the Norse creation story among other great tales, in which Thor and the other gods are humanized. Torsburg (Thor’s fortress) in Gotland. 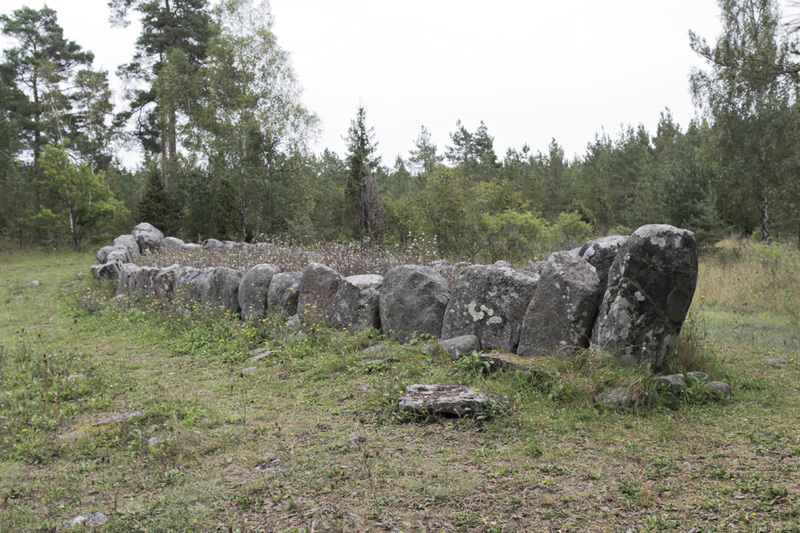 Initially assumed to be predate the Viking age by hundreds of years, archeologists have recently dated the upper part of the wall to the 9th Century. Scan from a 4″x5″ negative. Photo by Jessica Auer.